This article is about the video game originally published for the Nintendo Entertainment System. For further uses, see Super Mario Bros. (disambiguation). "SMB" redirects here. For information about the game known in Japan and Europe as Super Mario Ball, see Mario Pinball Land. Not to be confused with New Super Mario Bros..
Super Mario Bros. is a video game released for the Family Computer and Nintendo Entertainment System in 1985. It shifted the gameplay away from its single-screen arcade predecessor, Mario Bros., and instead featured side-scrolling platformer levels. While not the first game of the Mario franchise, Super Mario Bros. is the most iconic, and introduced various series staples, from power-ups, to classic enemies like Little Goombas, to the basic premise of rescuing Princess Toadstool from King Koopa. As well as kicking off an entire series of Super Mario platformer games, the wild success of Super Mario Bros. popularized the genre as a whole, helped revive the North American gaming industry after the 1983 video game crash, and was largely responsible for the initial success of the NES, with which it was bundled a launch title. Until it was eventually surpassed by Wii Sports, Super Mario Bros. was the best selling video game of all time for nearly three decades, with over 40 million copies sold worldwide. The exact day of the North American release of Super Mario Bros. is heavily disputed, with different sources giving different dates with no way to verify them. Regardless, Nintendo officially pinpoints the release date as October 18, 1985. One day, the Mushroom Kingdom was invaded by the Koopa, a tribe of turtles capable of using powerful dark magic. Their magic was used to transform all the Mushroom People into inanimate objects such as rocks, bricks, and even horsehair plants, thus spelling the kingdom's downfall. Only Princess Toadstool can undo the spell and restore her people back to life, but she is being held captive by King Koopa himself. Mario hears of the princess's plight, and sets out on a quest through 32 stages to topple the Turtle Tribe and save the once-peaceful kingdom. Super Mario in World 1-1. Super Mario Bros. is divided into eight worlds, each of them containing four levels. Mario (or, in the case of a second player, his brother Luigi) has to get to the end of the level by jumping over various gaps and avoiding the enemies on his way. 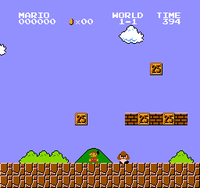 Mario can use several platforms (some of them collapse when Mario lands on them), stairs in the level, as well as jumping boards. There are also pipes along the way, some of which Mario can enter to visit various secret coin rooms before returning to the level, a bit further ahead than when he left. Enemies include Little Goombas, Koopa Troopas, Buzzy Beetles, Koopa Paratroopas, Bullet Bills, Hammer Brothers, and leaping Cheep-cheeps. All these enemies can be defeated when Mario jumps on them. Koopa Troopas and Buzzy Beetles cower in their shell when jumped on, which Mario can kick to defeat other enemies with. Koopa Paratroopas lose their wings and fall to the ground when Mario jumps on them. Other enemies include Piranha Plants, and the Spiny-throwing Lakitus, and Mario has to either shoot fireballs at them or just avoid them. There are two levels which take place underwater. In the water, Mario can swim freely from the top to the bottom of the screen. The enemies in underwater levels are Bloobers and Cheep-cheeps. Mario can only defeat these creatures by shooting them with fireballs. Mario swimming in a water level. If regular Mario takes a hit, falls down a pit, or if the Time Limit runs out, he loses a life, and restarts the level. The point where Mario continues depends on how far he ran through the level before getting defeated; either from the beginning, or at one of several invisible "checkpoints" throughout the level. After a Game Over, pressing while holding on the title screen allows the player to continue from the start of the world. In a 2-player game, if this is done by whoever got a Game Over second, both players will begin in the same world where the second player's game ended. Mario can get special power-ups out of ? Blocks or, uncommonly, Brick Blocks. Most of the ? Blocks in which Mario can find these items are visible, but some are hidden and only become visible when Mario hits them from beneath. With the Magic Mushroom, he turns into Super Mario. As Super Mario, he can survive the hit of an enemy one time, at the cost of turning back to regular Mario. He may also destroy empty Brick Blocks by jumping beneath them. Additionally, he can also get the Fire Flower. With the Fire Flower, Super Mario turns into Fiery Mario, which allows him to shoot fireballs at enemies to defeat them from a distance. With the 1 up Mushroom, he gains an additional life; he can also get an extra life if he collects a hundred coins. With the Starman, which can only be found in Brick Blocks, Mario turns invincible for a short amount of time, and can defeat enemies by simply touching them. Mario facing Bowser at the end of World 8-4. At the end of each level, a castle stands with a flagpole nearby. When Mario reaches the flagpole, he takes down the enemy flag and enters the castle, completing the level. The higher the spot that Mario hits the flagpole, the more points he receives. If there are two players playing the game, Luigi's turn comes whenever Mario loses a life. Luigi has no special abilities in the game that are different from Mario's. The fourth level of each world plays inside a castle. They are usually filled with Fire-Bars and Podoboos. At the end of a castle level, Mario is confronted with a fake Bowser in Worlds 1 through 7 and the actual Bowser in World 8. Mario and Luigi ordinarily have no way to hurt the fake Bowsers or the actual Bowser, and have to either use the ax to destroy the bridge, causing either the false or real one to fall into the lava, or pelt him with a number of fireballs, which produces the same result and reveals the true forms of the fakes. After defeating an impostor, Mario frees one of the seven remaining mushroom retainers from the castle, at which point they say their iconic phrase: "Thank you, Mario! But our princess is in another castle!" At the end of the castle in World 8, Mario frees the grateful Princess Toadstool and completes his adventure, having the choice to continue playing in a "new quest." In this second quest, the player gets to choose a world, and replay some levels. 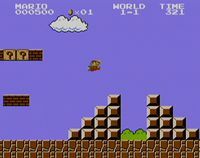 However, all Little Goombas are replaced by Buzzy Beetles, all ground enemies are also considerably faster, some platforms and Elevators are shortened in length, and the level design is slightly changed for some levels (see below at "Hard mode"). A squid-like sentry that persistently pursues the player. A slow but steady bullet that has eyes and arms. They come from Turtle Cannons, and the only way to defeat them is to stomp on them or hit them while under the influence of a Starman. A small turtle that hides in its shell when jumped on, just like Koopa Troopas; unlike them, however, it is immune to fireballs. They replace Little Goombas in Hard Mode. A red, green, or gray fish normally found swimming in water. In certain levels, starting with World 2-3, they will leap from the water, trying to hit Mario or Luigi. Various fireballs stacked together moving either clockwise or counterclockwise. Their length may vary. A green biped, helmeted Koopa that comes in a pair. They throw an endless number of hammers towards Mario, and at certain times they jump. A Koopa Troopa with wings. Green ones jump towards the player or fly back and forth, while red ones fly up and down. A soldier of the Turtle Empire that marches onwards. If stomped, it retreats in its shell, which can be kicked to hit other enemies and gain points. Green ones walk back and forth just like Little Goombas, and red ones timidly turn around when they find a pit. A bespectacled Koopa hiding in a small cloud. It throws an infinite number of Spiny's eggs towards the player. A mushroom traitor that walks back and forth. They are the weakest and most common enemies throughout the game and can be stomped or hit with fireballs or a Starman. They are replaced with Buzzy Beetles in Hard Mode. A carnivorous plant that lives in a pipe. It rises up trying to hit Mario and retreats. If Mario is near, it will not rise up. A fireball guardian of the Koopa King's lair. It jumps from the lava, trying to hit Mario. Lakitu's small yet tough pet with a red, spiked shell. If Mario tries to stomp it, he will get damaged. A red, spiked egg thrown by Lakitus. Once it hits the ground, it immediately hatches into a Spiny. 200 points Very Common Collecting 100 of them gives an extra life. 1000 points Uncommon Gives the Super form. 1000 points Uncommon Gives the ability to shoot fireballs. 1000 points Rare Gives invincibility for a moment. 0 points Rare Gives an extra life. Weakest form used when a new game begins. Can lose a life by touching an enemy or obstacle. Gains the ability to break Brick Blocks. Reverts back into regular form by touching an enemy or obstacle. Gains the ability to throw fireballs to defeat enemies. Becomes invincible for a short period of time. Immune to harm from any enemies or obstacles. Can defeat most enemies without jumping on them. Can still lose a life by falling into a pit or running out of time. After beating the main game, the player is given the option to pick a world to play in "a new quest"—a harder mode where all Little Goombas are replaced by Buzzy Beetles, and all enemies walk faster; all of the elevator-style lifts are about sixty percent of their original size, while Fire-Bars appear in all possible locations. Mario and Luigi gain no special powers in hard mode, and they receive no extra points when they defeat an enemy. The story remains exactly the same, as each of the first seven castles contain a mushroom retainer that needs rescuing, while the eighth castle has Princess Toadstool. If the player finishes the game on hard mode, they will not unlock anything new from the previous time the game was finished. However, points can be gained faster by jumping on a Buzzy Beetle and then running with the shell as it hits other Buzzy Beetles and Koopa Troopas. Earlier levels in hard mode are the same as their harder clones; for instance, 1-3, which is an easier version of 5-3 in the normal game, is identical to it in hard mode. The Minus World is an endless underwater level, identical to World 7-2, which is accessed through a programming glitch. There is no way to successfully complete the level, as entering the pipe at the end will simply return Mario or Luigi to the one at the beginning. While there is no strategic advantage in performing this glitch, many find it intriguing. The glitch was removed in all remakes of the game, excluding the imports and Virtual Console remakes. The Japanese Family Computer Disk System version of the game includes a different version of the Minus World. It contains three levels which can be beaten, and once -3 is complete, the player will return to the title screen as if they had beaten the game. 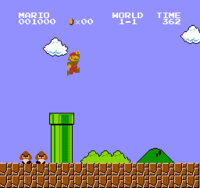 To perform the glitch, Mario must go to World 1-2 and stand on top of the pipe that leads to the above-ground flag, without going in the pipe. Then he must break the second and third block from the pipe, but leave the one on the far right. Then he must stand on the left edge of the pipe (facing left) and duck. He then has to jump while in a ducking position and move right in mid-air (while still facing left). If done correctly, Mario will go through the block on the far right and through the wall to the Warp Zone. Mario must then go through the pipe that would normally lead to World 2-1 or World 4-1, and Mario will enter the Minus World. If World 2-2 or 7-2 is edited in a ROM editor so that it is possible to beat it during the underwater segment, there is a World -2, an underwater version of 3-4. If World 3-4 is edited in a ROM editor, then there is a World -3. It is also a version of 3-4, but with overworld graphics; beating World -3 takes the player to World -4, a level which is just a blank screen. In some levels, it is possible to jump over the flagpole. Beyond the flag pole is nothing but an endless path. There is nothing to do; all that can be done is wait for the timer to get to zero. To do this glitch in World 1-1, right after the second pit, Mario needs to wait for the Koopa Troopa to about to fall into the pit and simultaneously jump at the top of the level right above the Koopa. After that, the Koopa will be stuck underneath the level, but the player will still be able to see it. When the Koopa starts to walk under the level, Mario should follow it to the end. Along the way, it is required to grab a Magic Mushroom. When the Koopa is halfway between the staircase and the flagpole, the player must do the glitch again and Mario will jump above the flagpole. To do this glitch in World 3-3, at the end of the level the player must stand on the last lift until another one has completely lifted, before falling off. After that, the player must accelerate as fast as possible and jump from the far edge of the lift. The lift should not lower while doing so. There is a brick right after the fortress's or castle's first door, which stops Mario from going past the Fortress at the end of the levels. In Super Mario Bros.: The Lost Levels, this is actually exploited to hide Warp Zones. In worlds 3-1 and A-3, there are warp zones placed beyond the goals. In other worlds, while it is possible to go over the flagpole, the edge of the world is a few steps past the fortress, and the player is not able go far enough for the flagpole to scroll off the screen. This glitch was fixed in the SNES version of the game. This glitch/trick was featured in the 25th anniversary super play. Development for Super Mario Bros. began after Shigeru Miyamoto and Takashi Tezuka finished two other games together beforehand: Excitebike and Devil World. When designing Super Mario Bros., they wanted to use the scrolling screens of Excitebike and the large character sprites from Devil World, in order to make Super Mario Bros. stand out from other titles. Miyamoto and Tezuka wanted to fit various technologies into the game, comparing it to a puzzle. The name "Super Mario Bros." also came from Mario's new Super form. Super Mario Bros. was developed at the same time as The Legend of Zelda, and both shared numerous staff members: Shigeru Miyamoto, Takashi Tezuka, Toshihiko Nakago, Koji Kondo, Kazuaki Morita, Yasunari Nishida, and Hiroshi Yamauchi. According to the developers, some aspects in Super Mario Bros. were taken from The Legend of Zelda; Fire-Bars were one example, as they were present in the dungeons in The Legend of Zelda. Miyamoto implemented Fire-Bars into Super Mario Bros. as an obstacle. The main goal of Super Mario Bros. was to have a character travel through many lands with all different themes to each other and it would feature a diverse terrain, such as land, water, and sky. They also intended for the main character to be twice the size of the final one. In the beginning of developing the game, the placeholder playable character was a 16×32 pixel square. The square couldn't even jump and as a result, Tezuka suggested making Mario the playable character instead of the square due to the popularity of Mario Bros., which Miyamoto accepted. Nakago and his team, Systems Research and Development (SRD), colored the background blue in some levels. This was unusual, because video games released during this time period usually had a black background, to avoid eye-strain and to avoid getting distracted by the bright colors. After coloring the background blue in some levels, Nakago then started designing maps for this game. Miyamoto wanted the levels to be around a minute long and he told SRD to do so. He then realized that it usually takes about a second to travel across a screen, and that numerous screens would have been implemented in one stage. SRD first thought that Miyamoto had requested them to make 60 screens per stage, but Miyamoto then explained that obstacles in each screen would slow down the player's progress, which resulted in an average of about 12 screens per level. The stage with the most screens has only 32, which is about half of what SRD had originally expected. When designing the stages themselves, because a level creating tool wasn't available to them at the time, Miyamoto and Tezuka would draw the levels on graph paper, and then Nakago and his team would design and program it into the game; if edits were to be made to the original drawings, a sheet of clear paper was placed over the original drawings. Nakago has stated that a lot of documents were sent to his team everyday to change some aspects of stages. Every day, the group would do all they could do of what was stated in the documents, and would work until 10 at night. The game was far more focused on action than platforming. The game was split between ground and sky segments, which had Mario shooting enemies. Mario could use weapons and the control scheme was different as a result, such as having the up arrow of the used as the jump button. Super Mario Bros. received critical acclaim and is considered one of the best games of all time. One of the most-praised aspects of the game is the precise controls, which allow players to control how far and high the characters jump and how fast they can run. The game popularized side-scrolling video games, and the game has since received several sequels and spin-offs, and many different ports and alternative versions. All characters, enemies, and items found in the game have become core elements of the Mario franchise, and the plot of Bowser kidnapping the princess has continued to be used throughout the core Super Mario series. The game was placed 14th in the 100th issue of Nintendo Power's "100 best Nintendo games of all time" in 1997. It ranked the first spot in Electronic Gaming Monthly's "Greatest 200 Games of Their Time", named in IGN's top 100 games of all time lists in 2005 and 2007, and declared the second-best Mario game of all time. IGN also placed it 3rd in their Top 100 NES Games list. Super Mario Bros. sold 40.24 million units with its NES release, being the best-selling Mario game and among the best-selling video games of all time. It has received several other works such as The Super Mario Bros. Super Show! and the Super Mario Bros. film. The game's impact on popular culture was so big that during 2010, a street in Zaragoza, Aragón (Spain), was named after it. Super Mario Bros. Special: A sequel created by Hudson Soft. Super Mario Bros.: The Lost Levels: A direct sequel to Super Mario Bros. using many of the same sounds and sprites. VS. Super Mario Bros.: This is a harder version of Super Mario Bros. for arcades. All Night Nippon Super Mario Bros.: A remake of the '85 classic with elements that pertain to the radio program All Night Nippon replacing some of the original game's elements. Super Mario Bros. 2: The non-Japanese sequel to this game. Mushrooms, Stars, and Shells appear. The Super Mario Bros. overworld theme plays in the parallel dimension of Subcon. Super Mario Bros. 3: Bowser returns along with the rest of the Koopa Troop, as well as elements from the original Super Mario Bros. When Princess Toadstool is saved, she says, "Thank you! But our Princess is in another castle!…Just kidding!" That is a reference to Toad's lines in this game. The original Super Mario Bros. overworld theme plays when the Music Box is used. The underground theme returns in this game. Super Mario Land: Mario's sprite in this game is near identical to his sprite from Super Mario Bros. Gameplay is also near identical. Alleyway: Several sprites from Super Mario Bros. appear in bonus levels. Super Mario World: If the player waits on the Special Zone map for two minutes, a rearrangement of the Super Mario Bros. overworld theme will start playing. Super Mario Kart: Mario's theme is an arrangement of part of the overworld theme from Super Mario Bros.
Super Mario World 2: Yoshi's Island/Yoshi's New Island: The course clear fanfare can be heard in the scene that Baby Mario and Baby Luigi return to their home. Super Mario RPG: Legend of the Seven Stars: If the player goes behind a curtain in Booster Tower, Mario briefly turns into his 8-bit sprite from Super Mario Bros. Also, when Mario takes a shower at Marrymore, he can be heard singing the overworld theme from this game. The music at Mario's Pad contains an arrangement of the overworld theme, and it also plays on the "THE END" screen at the end of the game. Super Mario 64: Outside the Warp Pipe that leads to the final boss, carved into pillars are what look like sprites of Mario and Bowser from this game. The underground theme from Super Mario Bros. is added to the beat of the music for Hazy Maze Cave/Wet-Dry World. The overworld theme from this game is arranged and plays on the screen with Mario's face. Paper Mario: If Mario jumps into a huge vase in a room in the first floor of the Boo's Mansion, he will become 8-bit. Unlike Paper Mario: The Thousand Year-Door, his allies will not become an 8-bit form. Super Smash Bros.: The main theme can be heard on the playable stage, Peach's Castle. The Mushroom Kingdom happens to be a stage which can be unlocked. When Mario performs his up taunt, he mimics his standing pose in Super Mario Bros. Also, Mario's and Luigi's victory fanfare is a remix of the tune that plays when a brother completes a level. Mario's, Dr. Mario's and Luigi's helpless animations are based on the pose Mario and Luigi take upon death in Super Mario Bros. Many items from this game are usable in Super Smash Bros.
Game and Watch Gallery 3: Playing Star Mode for the Modern Version of Donkey Kong Jr. will have the Goomba enemies being replaced by Spinies, similar to the new quest mode in Super Mario Bros. replacing the Goombas with Buzzy Beetles. Luigi's Mansion: Although not distinctly noted as such, the idea of King Boo using a Bowser decoy (through magic of his) may be loosely based on the seven fake Bowsers in this game. Super Smash Bros. Melee: The main theme and underground theme can be heard on the playable stage of Peach's Castle. One can also hear the underwater theme in the Rainbow Cruise stage. Peach and Bowser appear as playable characters in this game. Many enemies from this game appear in Super Smash Bros. Melee's Adventure Mode. Super Mario Sunshine: A castle level is seen when Mario first met F.L.U.D.D. The secret levels play this game's main theme, and various 8-bit pattern are seen in the background of the secret levels of Ricco Harbor and Sirena Beach. The underwater theme can be heard in the demo. Super Mario Advance 4: Super Mario Bros. 3: Some of the available levels for World-e include reproductions of this game's Worlds 1-1, 1-2, 1-3, 1-4, and 2-2 in Super Mario Advance 4's style. Only World 1-1 was made available outside Japan. Game & Watch Gallery 4: Like in Game & Watch Gallery 3 above, playing Star Mode for the Modern Version of Donkey Kong Jr. will have the Goomba enemies being replaced by Spinies, similar to the new quest mode in Super Mario Bros. replacing the Goombas with Buzzy Beetles. Mario & Luigi: Superstar Saga: At the Border between the Mushroom Kingdom and Beanbean Kingdom, there's a minigame called Border Jump that uses the level end of most levels in the original game (including the flagpole that was used to tell time in the game). Also, there is a 2D obstacle room before Roy's room which ends with Mario getting the ax and burning the Bowser decoy above a lava bridge. Finally, Mario can be heard singing the main theme while taking a shower in the beginning. An arrangement of the overworld theme plays in Little Fungitown. In Woohoo Hooniversity, a type of question block from Super Mario Bros. can be seen among other types. The Border Jump mini-game uses a background with a Goal Pole and castle from Super Mario Bros. Also, an arrangement of the underground theme is used as the music for the mini-game Mysterious Mine Carts. Paper Mario: The Thousand-Year Door: If the player jumps up into a vent and then comes down into the changing room in the X-Naut Fortress then Mario and all his allies will become 8-bit and similar in style to the Super Mario Bros. sprites. Mario Superstar Baseball: The loading screen has Mario hitting a ? Block in graphics from Super Mario Bros.
Mario Tennis: Power Tour: In the ending, a rearrangement of the main theme song plays. Mario & Luigi: Partners in Time: Toadsworth the Younger states when Baby Peach flies away "You will save her, won't you? I assure you she's NOT in another castle. ", referencing the mushroom retainers' famous line "Thank you, Mario! But our princess is in another castle!". An arrangement of the overworld theme is used for tutorials in this game. Tetris DS: The first two levels were World 1-1, 3 and 7 were underground based, 8 and 9 are up in heights, and 10 was a castle. New Super Mario Bros.: Many things from Super Mario Bros. return here, such as flagpoles and Warp Zones (in the form of cannons). And, when connecting to a multiplayer game, Mario can be seen running what looks like World 1-2. Also, a close-up of Mario from Super Mario Bros. as well as a picture from said game are unlockable backgrounds. The sound effect that plays when Mario or Luigi slides down the Goal Pole is reused, albeit in reversed form. Mario Hoops 3-on-3: In Bloocheep Sea, an arrangement of the underwater theme is played; in Mario Stadium, one can see an 8-bit Mario chasing two Goombas. Also, the music for Bowser's Castle is a cover of the castle theme. Super Paper Mario: The sprites of Mario, Luigi, Peach, and Bowser appear around said character when they collect the Pal Pills. Also, when any character (including a Koopa Troopa) grabs a Mega Star, they turn into a huge version of their Super Mario Bros. sprites. (Mario and Luigi are their small forms in both). A portion of Chapter 1-1 and Chapter 3-1 is also exactly identical to World 1-1 and World 1-2, respectively. Super Mario Galaxy: In Toy Time Galaxy, there's a huge 8-bit Mario/Luigi and plays the main theme of Super Mario Bros. Also in Flipswitch Galaxy, the background contains an overworld scene and an underground scene from this game, along with an arrangement of the underground theme from Super Mario Bros. Also, some of the Musical Notes are music from this game. Super Smash Bros. Brawl: The stage Mushroomy Kingdom is based on Worlds 1-1 and 1-2 of this game. It also has arranged tracks from this game, which are the two versions of the Overworld Theme, the Underground Theme, and the Underwater Theme. Lakitu and Spinies and Hammer Bro appear as Assist Trophies. Lakitu and Spinies retain their original 8-bit look from Super Mario Bros. Also, many enemies from this game appear in Super Smash Bros. Brawl's the Subspace Emissary Mode. Wii Sports Resort: In Island Flyover, if the player flies by the Hillside Cabins, the Super Mario Bros. overworld and game over theme can be heard. Wii Fit: Some of the sprites from this game are hidden across the island. New Super Mario Bros. Wii: The second level of Coin Courses looks exactly like World 1-1 from Super Mario Bros. An arrangement of the overworld theme from Super Mario Bros. plays in Toad Houses. The first few notes of this theme plays during the beginning of the staff roll. Super Mario Galaxy 2: The music for Supermassive Galaxy, which itself is a remix of Toy Time Galaxy's music from Super Mario Galaxy, is based on the overworld theme from Super Mario Bros. The first few notes of this theme plays when switching from Mario and Luigi and back. Other music from Super Mario Bros. returned from Super Mario Galaxy as well. Also in the second area of the Grandmaster Galaxy, there is a backdrop showing moving sprites of items and an 8-bit Mario and Luigi from this game. Mario Squared Galaxy takes place on an 8-bit Mario, as well as an 8-bit Luigi (during the mission "Luigi's Purple Coin Chaos"), Mario and Luigi's sprites from this game. Mario Sports Mix: The underwater theme is available as a song in Harmony Hustle. Super Mario 3D Land: Mario's sprite from this game is used as the marker of where Mario is in a world. Mario also hums the main theme in the cutscene between Worlds 5 and 6. Fake Bowsers also return. An arrangement of the overworld theme is featured in this game. Mario Kart 7: Piranha Plant Slide is heavily based on the underground levels of this game. New Super Mario Bros. 2: The first course in Coin Rush's Gold Classics Pack is based off of World 1-1 and World 1-2. Also, the last course is based off of Bowser's Castle. Sometimes when the game loads, a small part of the overworld theme plays. New Super Mario Bros. U: Sprites from this game are used in the game menus. New Super Luigi U - Various sprites of Luigi are reused as hidden Luigis. Mario & Luigi: Dream Team: The theme heard when there is a tutorial is a rearrangement of the overworld theme. Super Mario 3D World: Mario's sprite from this game is seen on the saving screen. His sprite can also be seen in a bonus area of Bob-ombs Below, and it even plays a remix of the overworld theme (whose theme comes from Super Mario 3D Land). Luigi's sprite can be spotted in some levels and on the button to enter the Luigi Bros. game. NES Remix: Super Mario Bros. is a game remixed in this game. Mario Party: Island Tour: The theme heard in the minigames Xylophone Home and Goomba Tower Takedown is a remix of the overworld theme. NES Remix 2: A port of the game titled Super Luigi Bros. is where the player controls Luigi, and all the levels are mirrored. Mario Kart 8/Mario Kart 8 Deluxe: Various sprites of enemies and scenery can be seen on pots in Bone-Dry Dunes. The music for Super Bell Subway incorporates elements of the underground theme from this game, as well as the course having graffiti representing World 1-2 from this game. Also, Piranha Plant Slide, which is based heavily on the underground levels of this game, returns from Mario Kart 7. Super Smash Bros. for Nintendo 3DS / Wii U: Fire Bars appear as an item in these games. In Super Smash Bros. for Nintendo 3DS, the Mushroomy Kingdom stage, which is based on Worlds 1-1 and 1-2 from Super Mario Bros., returns from Super Smash Bros. Brawl. A medley of songs from this game is featured, which can be heard on the Mushroom Kingdom U and Super Mario Maker stages in Super Smash Bros. for Wii U; it begins with a small portion of the castle theme, followed by the overworld, underwater, and underground themes. The track "Ground Theme / Underground Theme (Super Mario Bros.)", which also contains the castle theme, can be heard on the stages Golden Plains in Super Smash Bros. for Nintendo 3DS and Mushroom Kingdom U and Super Mario Maker in Super Smash Bros. for Wii U.
Super Mario Maker/Super Mario Maker for Nintendo 3DS: The game is used as one of the graphical styles for these games. Super Mario Odyssey: In some parts of the game, Mario can walk within walls from a 2D perspective that uses sprites and sound effects from Super Mario Bros., as well as altering the music to an 8-bit variation. An arrangement of the overworld theme from this game plays in the New Donk City Auditorium. A scene of Mario confronting Bowser in Super Mario Bros. can be seen when Mario captures Bowser in this game. A replica of World 1-1 can be played in a theater in New Donk City. Super Mario Party: Mario's, Goomba's, Spiny's, Cheep Cheep's, and Bowser's sprites appear in Puzzle Hustle. Dart Gallery's background features neon lights resembling Super Mario Bros.'s overworld levels. The 25th anniversary version, with all the question marks on the ? Blocks changed to number 25's. 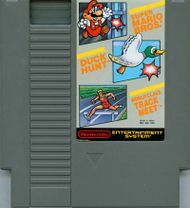 The 3-in-1 Super Mario Bros./Duck Hunt/World Class Track Meet cartridge. The playable demo in Super Smash Bros. Brawl. 1985 - Ported into the American arcade machine Nintendo PlayChoice-10. 1986 - Re-released on the Family Computer Disk System in Japan. 1986 - Released as a Game & Watch title. 1986 - Released in arcades as VS. Super Mario Bros..
1986 - Released on the Family Computer Disk System as All Night Nippon Super Mario Bros..
1988 - Re-released on the NES in the US as part of the 2-in-1 Super Mario Bros./Duck Hunt compilation, packaged with the NES Action Set. 1988 - Re-released on the NES in Europe as part of the Super Mario Bros./Tetris/Nintendo World Cup compilation, sold alone or with the Top Loader. 1990 - Re-released on the NES in the US as part of the 3-in-1 Super Mario Bros./Duck Hunt/World Class Track Meet compilation, packaged with the NES Power Set. 1990 - Re-released on the NES as part of Nintendo World Championships 1990. 1993 - Remake available on the Super Nintendo Entertainment System as part of the Super Mario All-Stars compilation (known as Super Mario Collection in Japan). Graphics and sound were updated, and many glitches were removed. 1994 - Remake available on the SNES in the US as part of the Super Mario All-Stars + Super Mario World compilation, packaged with the SNES Mario Set. 1999 - Remake released on the Game Boy Color as Super Mario Bros. Deluxe. The game featured the original game's graphics but loads of additional content. 2002 - The original game is available as an unlockable NES game in Animal Crossing. However, it can currently only be unlocked using a cheating device. 2004 - The original game was re-released on the Game Boy Advance as part of the NES Classics / Famicom Mini collection, celebrating 20 years of the Famicom in Japan. It was also re-released on September 13, 2005 in Japan to celebrate 20 years of the original NES game. 2006 - Available on the Wii as part of the Virtual Console. 2008 - Available in Super Smash Bros. Brawl as a playable demo. 2010 - Remake released with Super Mario All-Stars Limited Edition. 2010 - Virtual Console remake with the question marks on the ? Blocks replaced with "25", exclusively bundled with a special, red Wii. 2011 - Released on the 3DS as part of the Virtual Console. It is a free download for those who purchased a 3DS prior to the August 12th price drop. The full release version was released on January 5, 2012 in Japan, on February 16, 2012 in North America and on March 1, 2012 in Europe and Australia. 2013 - Released on the Wii U as part of the Virtual Console service via the Wii U eShop in Japan on June 5 and in Europe, Australia and North America on September. The game was also featured in NES Remix. 2014 - Re-released in NES Remix 2 as Super Luigi Bros. The game was also featured in Ultimate NES Remix along with the port of Super Mario Bros., Speed Mario Bros.
2014 - Available in Super Smash Bros. for Wii U as a playable demo. 2015 - Available as a "highlight" in amiibo tap: Nintendo's Greatest Bits. 2016 - Released as one of the 30 games included in the NES Classic Edition and Nintendo Classic Mini: Family Computer. 2018 - Available as one of the 20 NES titles at the Nintendo Switch Online subscription service's launch in September 2018, and for the first time can be played with other players online. Overworld Theme - Excerpt of the overworld theme. Lose a Life - The Life Lost theme. Game Over - The Game Over theme. Hurry Up! - The Hurry Up theme. Invincibility - The Super Star theme. Victory Theme - Theme that plays at the end of the levels. Toad Rescued - Theme that plays after defeating Fake Bowser/Bowser. Ending - Theme that plays at the end of the game. For this subject's image gallery, see Gallery:Super Mario Bros..
"Thank you Mario! But our princess is in another castle!" — Mushroom Retainer, Super Mario Bros.
"Thank you Mario! Your quest is over. We present you a new quest." — Princess Toadstool, Super Mario Bros.
Sūpā Mario Burazāzu Super Mario Bros.
Chāojí Mǎlìōu Xiōngdì Super Mario Bros. 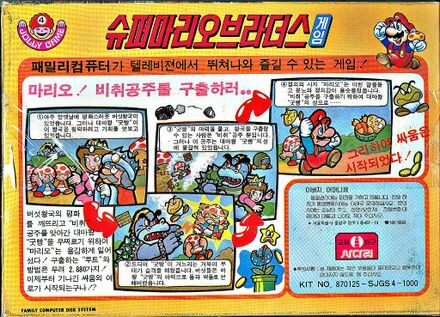 The original story of Super Mario Bros. (with early character designs) as seen on a board game based on Super Mario Bros.. An alternate set of pictures depicting the same events is in How to Win at Super Mario Bros. Despite being unmentioned in the Japanese manual, the Mushroom King appears in Asian-drawn strategy guide illustrations. The Guinness Book of World Records 2011: Gamer's Edition stated that this game was also remade on the Nintendo 64, which is incorrect. In North America, Mario's sprite on the cover is recolored and reused on the covers for the Donkey Kong and Mario Bros. NES releases. The clouds and bushes in Super Mario Bros. are actually the same sprite in different colors, most likely to save space. Piranha Plant Slide from Mario Kart 7 makes a reference to this, as the cloud and bushes are the same model in different colors. The ending theme in the Famicom Disk System version of The Lost Levels was first composed as the ending theme of Super Mario Bros., before being shortened due to storage limitations. There was some controversy to Mario as well as the NES version of Super Mario Bros., with Mario in particular being noted as having a slight physical similarity to the Soviet dictator Josef Stalin as well as replacing the Koopa flag (which resembled the Peace sign) with a flag that resembled the Soviet Red Star. Nintendo Power addressed this issue by trying to put Mario's moustache on Ivan Drago from Rocky IV and denying there was any intentional resemblance. ↑ Ed Acosta. (Jan 25, 2015) Super Mario Bros a+start level restart. YouTube. Retrieved January 12, 2016. ↑ YouTube video of "Minus World"
↑ "Super Mario Bros. main character originally started out as...a huge square"
↑ Nintendo (Nintendo of America) (June 16, 2015). Nintendo Digital Event @ E3 2015. YouTube. Retrieved June 19, 2015. ↑ Super Mario Sales Data: Historical Units Sold Numbers for NES, SNES, N64... GameCubicle. Retrieved January 25, 2015. ↑ From the description of 9-Volt's microgame "Super Mario Bros." in iQue's localization of WarioWare, Inc.: Mega Microgame$! This page was last edited on April 14, 2019, at 00:47.